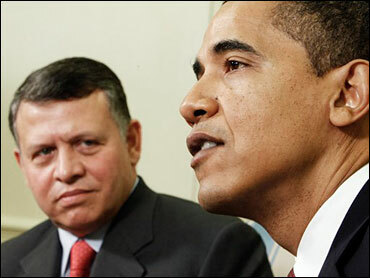 President Obama met with Jordan's King Abdullah today at the White House, and the main topic of discussion undoubtedly was the Mideast Peace process. Following the meeting, Mr. Obama once again declared that he is committed to a two-state solution, with Israelis and Palestinians living side by side. The president urged all involved to "step back from the abyss" and make hard choices for peace. "My hope would be that, over the next several months, that you start seeing gestures of good faith on all sides," he added. "We will be doing everything we can to encourage those confidence- building measures to take place." As has often been the case recently, Iran eventually took center stage in the discussion. A reporter asked Mr. Obama about comments Iranian President Mahmoud Ahmadinejad made yesterday at a United Nations sponsored conference on racism when called Israel "most cruel and repressive racist regime." Mr. Obama called the comments "appalling and objectionable." "There's no doubt that the kind of rhetoric that you saw from Ahmadinejad is not helpful," he added. "In fact, it is harmful, not just with respect to the possibility of U.S.-Iranian relations, but I think it actually undermines Iranians' position as the world as a whole." The U.S. was not represented at the conference in Switzerland, but many countries' representatives publicly walked out when the comments were made. The president also reiterated, however, that he is "serious about engagement" with Iran. "We will continue to pursue the -- the possibility of improved relations and a resolution to some of the critical issues in which there have been differences, particularly around the nuclear issue," he said. During the impromptu news conference, Mr. Obama also answered a question on the controversial release of memos last week detailing harsh CIA interrogation tactics. PRESIDENT OBAMA: Well, first of all, we have gone out of our way to complement the efforts of those Arab states that were involved in formulating the Arab Peace Initiative as a very constructive start. And obviously King Abdullah has taken great steps to ensure that that sustains itself, in terms of Arab support, even while we have seen a breakdown in negotiations. And that's a significant achievement for which King Abdullah and others deserve credit. So we want to continue to encourage a commitment on the part of the Arab states to the peace process. But there's no doubt that the kind of rhetoric you saw from Ahmadinejad is not helpful; in fact, it is harmful -- but not just with respect to the possibility of U.S.-Iranian relations, but I think it actually undermines Iranians' position in the world as a whole. We weren't at the conference, and what you saw was a whole host of other countries walking out and that language being condoned by people who may be more sympathetic to the long-term aspirations of the Iranian people. So I think it actually hurts Iran's position in the world. I am a strong supporter of a two-state solution. I have articulated that publically and I will articulate that privately. And I think that there are a lot of Israelis who also believe in a two-state solution. Unfortunately, right now what we've seen not just in Israel but within the Palestinian Territories, among the Arab states, worldwide, is a profound cynicism about the possibility of any progress being made whatsoever.